If you want tender meat that falls off the bone being barbequed to perfection, you will want the best smoker money can buy with quality. If you’re ready to get smokin’, are the neighborhood friendly cook, you won’t be disenchanted with our smoker reviews down the page. If you’re a barbeque fanatic who loves working with charcoal, we have charcoal smokers for you to review here. Offset smokers such as the #5. Char-Griller® listed below is a smoker having a main cooking area with a firebox on the side. These cook large amounts of meat with the smoke leaving through a stack on top. These usually use charcoal and some use wood with charcoal. Pellet grill smokers use wood pellets or briquettes in an external fire bin or hopper feeding the pellets into the firepot inside. You control the temperature by how fast the pellets feed into the firepot manually and some models are controlled digitally. These units can work as a grill or smoker. These are shaped like a box and #4 below is a box pig smoker. They are loaded from the top or front with wood or charcoal. These hold a large amount of food but do not have the insulation to hold heat. These are usually egg-shaped and can be used as a smoker or grill. These are great for those who smoke and grill often. 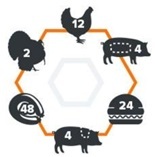 The #9 product below is a kamado grill. Check it out. The vertical drum smoke is shown below in #2. They are lightweight and easy to move about. Most can cook large quantities of meat without a problem. They are very popular and very basic. Most smokers come with more than one rack and some have four. They are removable and usually made of stainless-steel. Propane comes in a tank and is a sealed gas that is clean to use but is typically used for grills and not smokers. Smokers need wood for flavor and aroma. See the review for the best propane smoker in #10 below. 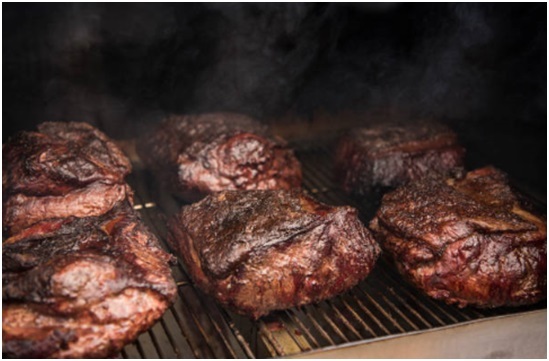 Made with a heavy gauge steel is best for the smoker to hold and dispense heat all over better so there aren’t variations in temperature rising and falling. You will want a smoker with a low to higher temperature span. The best smoking is accomplished using low heat for more time. When you want to sear a piece of meat or cook a turkey, you will want the smoker to get to 375-degrees F. and up. 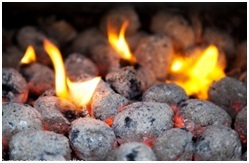 For controlling the temperature, charcoal and wood smokers use dampers to regulate the oxygen to the fuel. The damper(s) should be easy to get to being close to the firebox and smoke stack. With good insulating materials, you will keep the smoke and heat in for the best flavored meat for a longer time. The cooking area is where you put the meat and the type you plan to cook such as a whole large turkey or rack of ribs. Kamado grills and vertical smokers usually have more racks to put more food on. To move a large heavy unit around, you will want wheels. A smaller device with legs can be placed on a table; see item #11 below. Shelves that are adjustable are good to have for different meat thickness. You will want your racks to be made of stainless-steel for quick and easy cleaning. Grates made of black cast iron are exceptional. Any part made using chrome plating will wear out and might rust. Never leave your product out in the rain uncovered. Most parts will not be able to be cleaned in the dishwasher. I put my racks in the bathtub with lots of detergent and very hot water to soak all day. Price can range from $100 for those who cook out infrequently with less temperature control and insulation. The intermediate price of $100 to $200 is adequate for smokers for those people cooking more often having a temperature control and good sealing. When you cook for a large group, $300 to $400 will get you a larger unit with heavier gauge metal and better insulation. You get what you pay for. 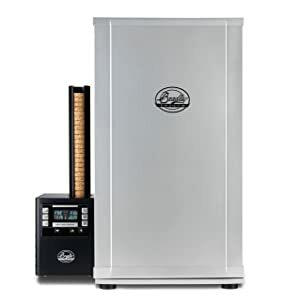 If you smoke and BBQ all the time, you will find smokers above $400 to be the better quality units with better insulation, temperature controls, and dampers. There is nothing more delicious than a smoked hunk of meat during the summertime. With the very best smoker, you will have sumptuous results every time for your eager eaters whether they like their meat bloody rare to shoe leather well done! 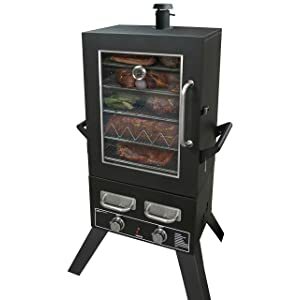 Read the electric smoker reviews below and choose the one with the type fuel you want to use. When you use wood chips you can select from wonderful flavors such as hickory, maple, pecan, mesquite, cherry, oak, and alder. Each different wood has its own specific flavor and my favorites are hickory and mesquite. Mesquite is good with beef and hickory is tasty with pork, yet everyone has different taste sensations. The MASTERBUILT® folks have been designing, engineering, and building smokers since 1973, starting in their own backyard building fish cookers. The rest is history for the fine working smoker. The MASTERBUILT® model number 20075315 is the Amazon.com® ASIN B00LK2SAYA number. It is also available in 30-inches. It is an exclusive unit to Amazon. The MASTERBUILT® electric smoker has caster wheels only on the back so to move it you grasp the bar handle and move it. It has a blue long-life LED light in its integrated display panel so that you can easily see it in the sun with a built-in RF (radio frequency) remote, meat probe with full foam insulation for keeping the heat inside the unit. 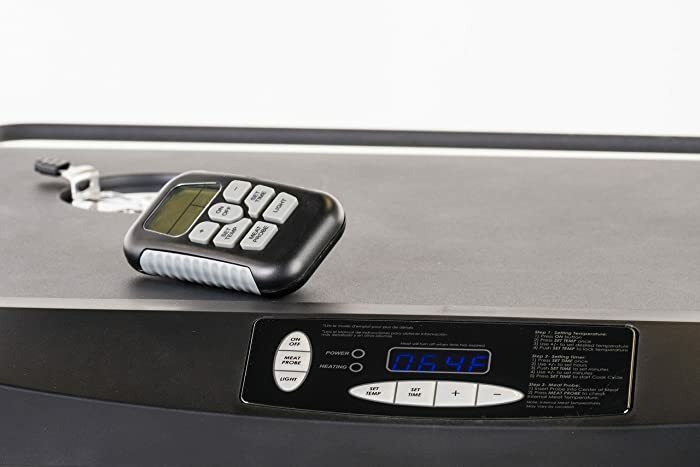 The control panel lets you set the time, temperature, and with the probe, you will know the internal temperature of the meat you’re cooking evenly. This smoker is a good choice being electric with 730-square inches of cooking space with the 4 chrome covered racks. It has an improved wood chip compartment and drip pan. On the right lower side is the wood chip loading area for your hickory wood chips or other flavors you love for your meat. You don’t need to open the door to add the chips. Apple wood is an excellent taste for pork and chicken while mesquite is a stronger smoky flavor for beef. Alder is good for smoking fish. The smoker also makes jerky with 2 recipes in the User’s Manual. You can cook a lot in the Masterbuilt Front Controller Electric Smoker. Temperature control is easy with digital controls. 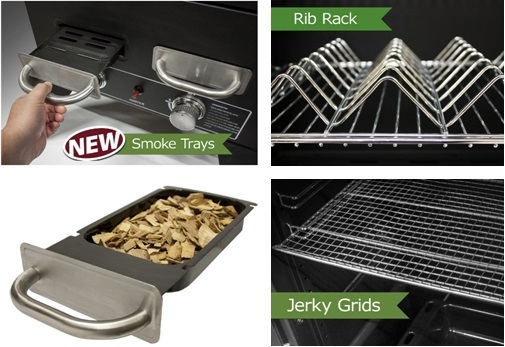 Adjustable racks provide the versatility to cook a whole turkey or other large cuts of meat. A built-in meat thermometer lets you keep tabs on the temperature. Using the remote, you can check meat temperature and make adjustments without moving from your lawn chair. A small wood chip tray means you’ll have to keep an eye on the chips to make sure they don’t get low, but the results are worth it. Even heating and consistent results make this smoker a standout for those looking to up their BBQ experiences. The controller is not waterproof, so don’t let the smoker sit outside in the rain. You can buy a smoker cover on Amazon. The cooker holds a ton of food with a maximum temperature of 275-degrees F.
When cleaning the smoker, use 50:50 hot water and apple cider vinegar in a spray bottle and shake well. Use a soft sponge. It is very important not to use harsh chemicals to clean the smoker and do not use soap or detergent. The dimensions are width 24.961-inches, depth/length 19.528-inches, height 40.157-inches and the gross weight is 84.633-pounds. Plug the UL® listed cord into a 110/120-Volt, 50/60-Hzreceptacle in North America. The coil is 1200-Watts and draws 10-Amps.California residents Click here for Proposition 65 warning. You will receive a User’s Manual and a 90-day Warranty. It is made in China. MASTERBUILT® Electric Smokehouse: Features and Pre-Seasoning video. 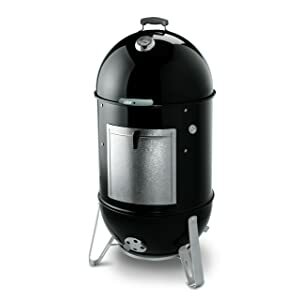 The Weber®, model number 731001 in shiny black on Amazon.com®, is the best vertical drum smoker you can buy from a company that has a solid reputation for its cookers and grills. When you want meat to fall off the bone with flavor to die for, this is the cooker for you using charcoal fuel. It also comes in 14- and 18-inch models but you won’t get a full rack of ribs on them. The model number 731001 will hold several large briskets. The glass dome lid has a built-in thermometer with a heat-resistant handle to remove with a cooking area of 726-square inches. The handle is glass reinforced and the 4 aluminum dampers that will not rust. It cooks from 100- to 350-degrees F.
The charcoal chamber grate is heavy gauge and the 2 cooking grates are nickel plated steel 22-1/2-inches-wide. You’ll love the porcelain enamel bowl, lid, center section and water pan that’s easy to clean. It has a silicone temperature grommet, rust-resistant aluminum fuel door, and heat shield. The dimensions with the lid closed are 48-1/2-inches high x 23-inches wide x 24-inches deep and weighs 68-pounds. 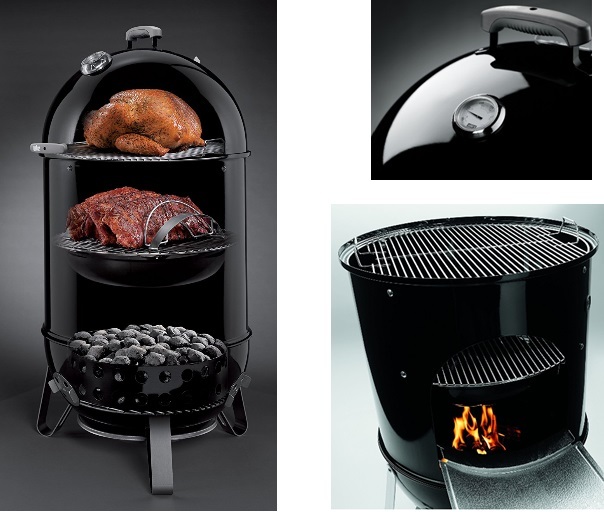 The Weber® charcoal smoker comes with a User’s Manual and a 10-year Limited Warranty. It is designed and built in Chicago, Illinois, USA. Weber® Grills: Smoking on your smoker video. 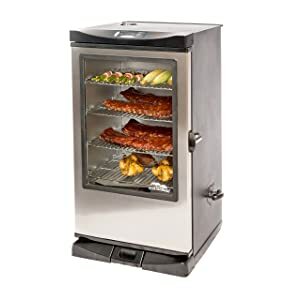 The Bradley®, model number BTDS76P on Amazon.com® is a 4-rack smoker with a cleverly designed tube on the left of the unit that sends 20 bisquettes/pucks through the cooking area lying flat to burn about 3-hours. You cannot use pellets, chips, or charcoal. The interior is polished stainless-steel that is easy to clean. The entire unit is epoxy steel for strength. 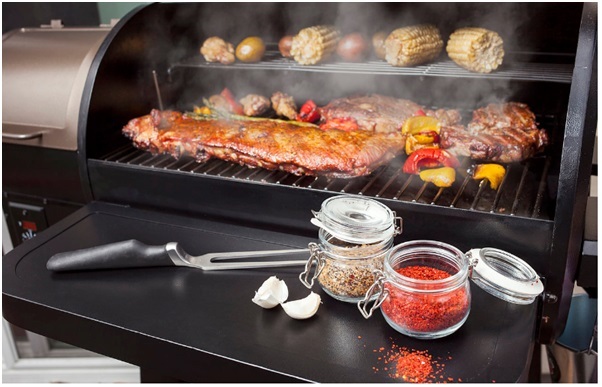 Barbequing outdoors with this smoker is convenient with the digital control unit where you set the temperate, time, and amount of smoke. Cook up fork tender beer battered pork, chicken, fish, veggies and more on the 4 racks up to 8-hours at up to 320-degrees F.
The racks will not fall out when pulled out having stops. A smart idea was when the designers moved the heat control to the smoke generator that eliminates moisture damage to the switch. The feet are larger for better stability. The generator on the left is removable with its side panel to get inside the unit to clean it. Plus, you can use it with hot or cold smoke. You’ll love the different flavors using maple, hickory, bourbon, or other flavored wood. Additionally, it can be used as a slow roasting oven or slow cooker. To save time running to the fridge in the house, have a cooler or ice chest outside with you for cold drinks. The outside measurements are 31.75-inches tall x 17-inches wide x 14-inches deep. It weighs 45-pounds empty. The inside dimensions are 15.24-inches wide x 11.5-inches deep x 25.5-inches tall. The 4 racks measure 10- x 13- x 1-inch. Plug the UL® listed cord into a 110/120-Volt, 50/60-Hz receptacle in North America. The 2288-cubic inch internal heater is 500-Watts, the smoking element is 125-Watts power at 5.5-Amps. 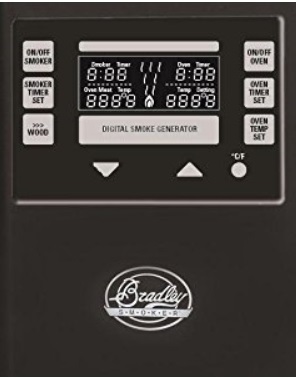 The Bradley digital smoker is ETL and CE certified. You buy electricity in kilowatt hours, which is 1000 watts used for 1-hour; therefore, you will pay about 18-cents for a kilowatt hour, so the burner would cost 18-cents for 2-hours. You will receive a recipe book, smoke generator, User’s Guide, and a 1-year Warranty. Set it and Forget it! The Bradley® Digital Smoker video. 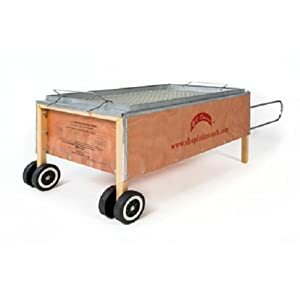 The BC (Bene Casa) pig roaster, model number BC-77176 on Amazon.com®, is large enough with natural treated wood on the outside lined with galvanized metal to undergo the heat needed. The Latin cooker caja (box) asadora (roaster) is perfect for a small pig or large cuts of meat. The double front wheels turn pushing with the handles at the opposite end for outdoor use only. It does not come with a thermometer, so be sure to use one inside the meat so that it’s done and not raw inside. You will enjoy the succulent meats every time with this professional style roaster. There are no electrical components using natural or processed charcoal holding up to 70-pounds of food. 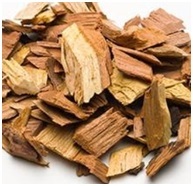 Wood smoking chips can also be added for different flavors. It will hold a pig at 70-pounds live weight that would roughly yield a 50-pound dressed weight. That’s a lot of pork! It will take several bags of charcoal to cook an entire pig and Kingsford is a good brand. You do not have to cook only pigs; it will cook turkeys, chicken, roasts and all types of food including fish. Do not let it sit outdoors without covering with a tarp; rain and snow will warp the wood. The outside dimensions are 48-inches long x 24-inches wide x 20-inches tall and the inner dimensions are 44-inches long x 24-inches x 8-inches tall. The unit comes with a charcoal grid, ash pan, large drip pan, 2 stainless steel roasting racks, and 4 stainless steel S-hooks with 2 free oven mitts and an injecting syringe for basting or adding flavors. You receive a User’s Manual, a 1-year Warranty on parts, and the accessories mentioned above. It is designed by the Cuban community in Florida, USA, and made in China. Martha Stewart cooks using La Caja Pig Roaster video. 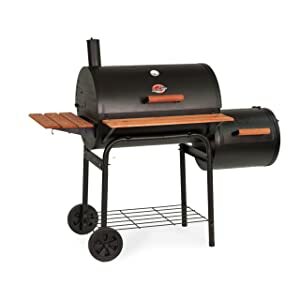 The Char-Griller® with side fire box, model number 1224 on Amazon.com®, is a great Texas smoke flavor barbequing unit for delicious meat. The fire grate is adjustable, has a heat gauge, and a double bottom. The wood slat trays on the side and front are handy for sitting plates and utensils on. The bottom outside grate will hold other things you need nearby. The is the very best charcoal smoker. The cooking grates are non-stick black cast iron just like the skillets we use. You add more charcoal to this unit without moving anything. The ash pan is easy to remove, dump, and clean with the unit made of heavy steel. The hood is airtight with a flanged hood, 2 shelves, and is rotisserie and warming rack adaptable. The large cooking area has 580-square inches of cooking surface with a 250-square inch side fire box for either charcoal cooking or smoking for a total cooking area of 830-square inches. 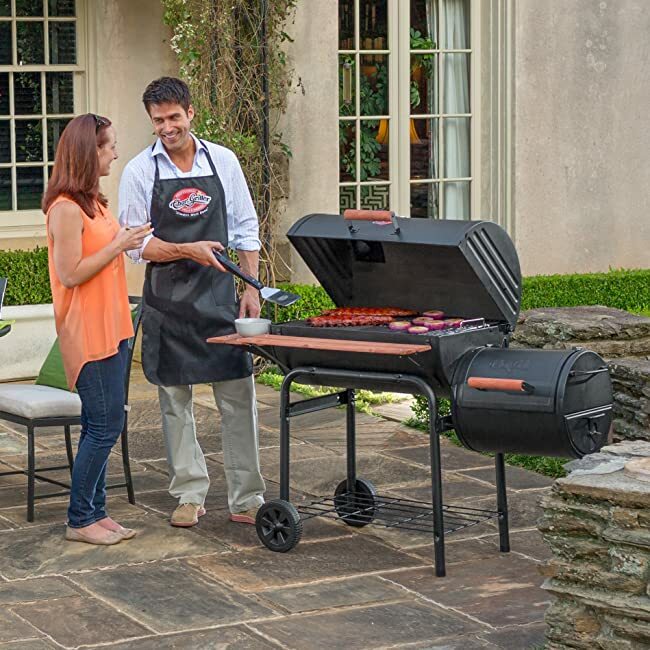 The grill measures 62-x 29-x 50-inches and it weighs 146-pounds with assembly required. You will receive a User’s Manual and a 5-year Warranty. It is made in China. Char-Griller® Smokin’ Pro modifications video. Smart idea! 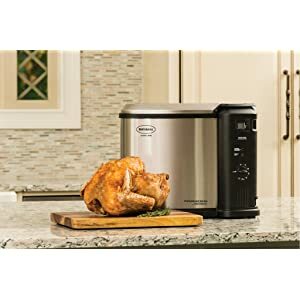 The Masterbuilt® Butterball® model number MB23010618 shown on Amazon.com® is a great selling turkey fryer for large birds and other meat and veggies. This is the latest model. The powerful 1650-Watts power fryer will do it all—fry, broil, and steam. The basket is aluminum with drain clips for quickly draining the oil out with its drain valve. The pot, basket, lid, and drain valve are dishwasher safe; however, the housing must be wiped clean by hand. The cord attaches to the base with a magnet to detach quickly and store for your safety. The Masterbuilt® Butterball® fryer uses one-third less cooking oil than other fryers and is built for commercial and home use. It will hold a 20-pound turkey, 5-pounds of chicken wings, and can be used for a huge seafood boil. It holds 3-gallons of oil or water for cooking veggies and boils and takes about 1-hour and 40-minutes to cook a 20-pound turkey. Set the digital timer to cook down for the time you set it for. The electric heating element is in the base of the unit. It is intended for inside but can be used outdoors sitting on a table if you have an electrical outlet. If you need an extension cord, only use the shortest one possible because cords lose power over distance. Only use a 12 AWG (American Wire Gauge) cord so there is no overload. Those skinny household extension cords will cause a fire. Peanut oil is preferred but you can use avocado, olive, canola, sunflower, and others but not lard or hard solid products such as Crisco®. The temperature range is from 125- to 375-degrees F. It takes 3.5-minutes per pound to cook a turkey. You can brine the turkey, but it cannot be stuffed with dressing because the dressing will be soaked with oil. The measurements are 18.3-inches long x 16.1-inches wide x 14.8-inches tall and it weighs 19.8-pounds. You will receive a User’s Manual and a 1-year Warranty. It is made in China. 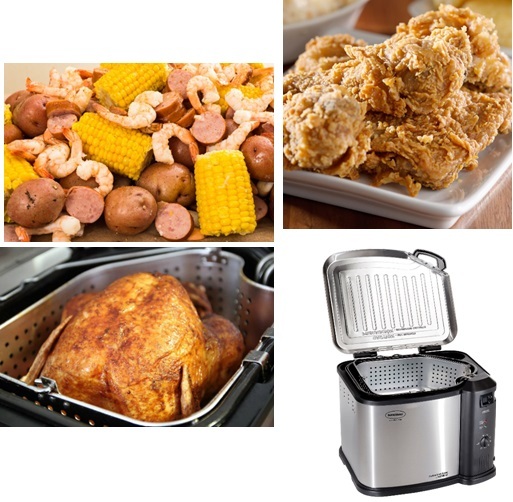 Product Review: Masterbuilt® Butterball® XL Electric Turkey Fryer video. 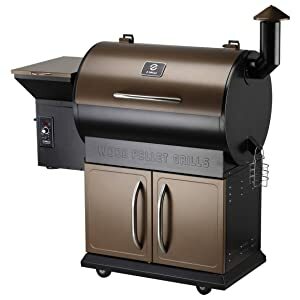 The Z Grills smoker, manufacturer model number YPG-700B and Amazon.com® ASIN B01L1TFG66, is a superb selling patio smoker, that also grills, bakes, roasts, braises, sears, char-grills, and barbeques with electric digital controls. Use outside only. The 8-in-1 unit is a stunning color of black and bronze using hard wood pellets. The main rack cooking area is 513-square inches with 187-square inches for the cooking or warming rack. 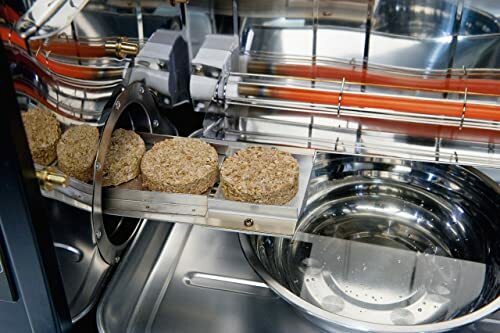 Its temperature is maintained from 160- to 450-degrees F. with an internal temperature sensor. The hopper holds 20-pounds for its tasty smoky permeated meat and food. The cart has caster wheels to move about outdoors. It uses fan forced convection. The BTU (British Thermal Units) per hour is 25,000. 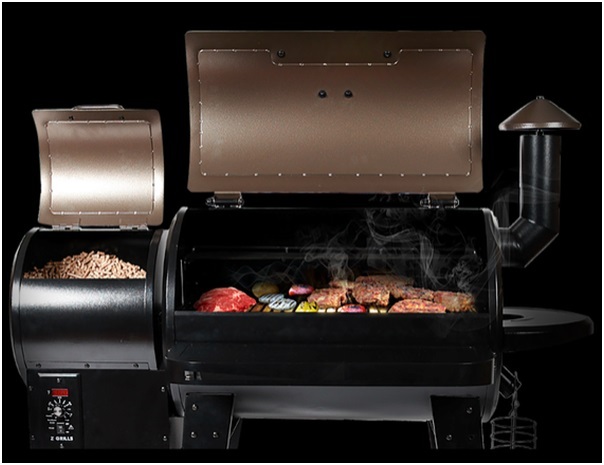 The Z Grills smoker and grill has a pellet purge system, electronic ignition system, and a shutdown recycle mode. The metal gauge for the lid sheet metal is 2.0 mm (0.0787-inch) and for the grill chamber 0.8 and 1.0 mm (0.0315 and 0.0394-inch). You will receive a User’s Manual and recipes are available at zgrills.com website. There is nothing to lose with a 30-day money-back Guarantee and a 3-year Warranty for whatever problem you might encounter. The full-length grill cover is included free with your grill purchase. The storage area at the bottom holds much cooking gear. 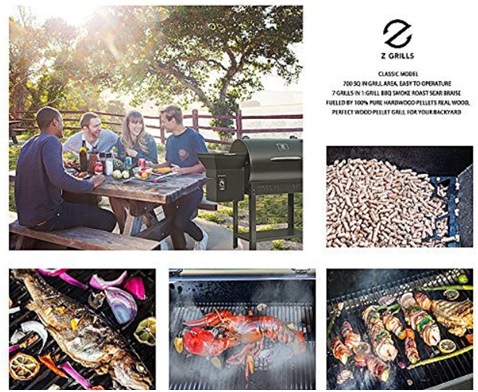 Z Grills-the affordable wood pellet grill video. The Ronco™ is a smaller unit to cook 2 chickens or barbeque other meat. 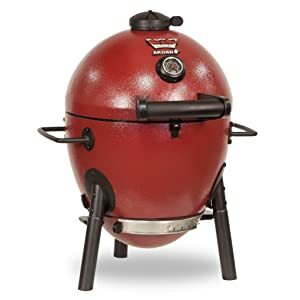 The model number ST5250RDGEN shown on Amazon.com® is available in the dark red color or stainless steel and is the best electric smoker for backyard cooking and using inside the house. Cook healthy meals with less fat and grease. The parts nest inside making this break down to be 7.75-inches tall to store in cabinets. It rotates for evenly cooked scrumptious eating when the food is done. The horizontal self-basting rotation makes your outside meat, fish, ribs, roasts, Cornish hens, poultry, ham, and vegetables crisp, tender, and loaded with flavor. The rotisserie basket is perfect for hamburgers, chicken pieces, vegetables, whole fish, fish fillets, steaks, chops, cutlets, and smaller flat roasts. It will also make kabobs and you will need to buy the rods separately. It will cook a 10-pound turkey or 2 hens side-by-side. It includes a multipurpose basket, rotisserie spit, carving platform, removable drip tray, oven gloves, and food ties. It has a digital display and you simply push the buttons. 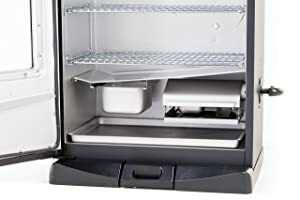 The drip tray, heat shield, and lid are dishwasher safe and easy to remove from the unit. Its glass lid rotates downward to fit over the base when storing. Don’t let it sit outside in the rain; moisture will run the electronics. It does not come with a thermometer, but you can buy the Ronco™ on Amazon.com®. The rotisserie and BBQ oven measures 17- x 15.5- x 12-inches weighing 17-pounds. Plug the UL® listed cord into a 110/120-Volt, 50/60-Hz receptacle in North America. The coil is 1250-Watts and draws about 10-Amps. California residents Click here for Proposition 65 warning. You will receive a User’s Manual with a few recipes and a 1-year Warranty. You will need to go to the Ronco™ website to register it. It is made in China. 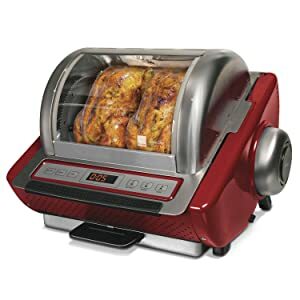 Ronco® EZ Store Rotisserie demo video. 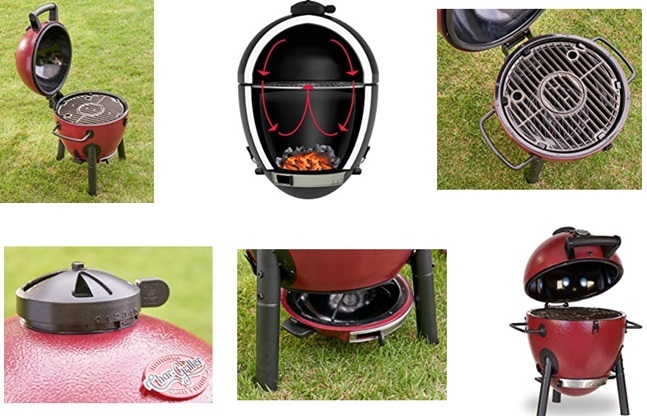 The Char-Griller®, E06614 on Amazon.com® is a best-selling kamado grill with many features made of heavy gauge triple-wall 22-gauge steel in a reddish color with orange peel texture. It’s great when tailgating, camping, or dinner in the park. Set it up in your backyard or on the patio being convenient and easy to move. It provides steady even heat with an easy to dump ash pan container. The cooking diameter is 14-inches. It cooks as if it were ceramic. It comes with 2 dampers, heat gauge, and insulation. The cast iron cooking grates keep flaring of flames low. The lid is hinged to easily open and close. For a smoky flavor, keep the lid closed. 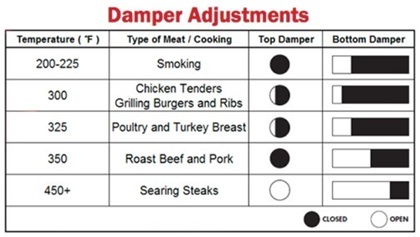 You will enjoy your fork tender meat when you follow the damper instructions found in your User’s Manual. The short legs will make it easier to use if you put the grill on a table top outdoors. Do not burn charcoal inside buildings! The grill will cook a small whole turkey, whole chickens, burgers, hot dogs, brisket, roasts, fish and anything you want to cook including corn on the cob and other vegetables. Wipe it clean with a rag or steel brush. Nothing goes into the dishwasher! The dimensions are 20-inches long x 20-inches wide x 25-inches tall and weighs 40-pounds. Full User Review for Char-Griller® Akorn® Jr.video. The Smoke Hollow® smoker, made by Outdoor Leisure Products, Inc., of Neosho, Missouri, USA, model number PS4415, is an outstanding and one of the best propane smokers available. This smoker is fantastic being improved and upgraded. With more than 6.5-cubic feet cooking surfaces, this smoker will cook plenty of food for your neighborhood gathering or family reunion. It stands on legs with no wheels. It has 2 stainless steel burners using both together or only with one, and each burner has its own temperature control for how you want your food done to perfection. This will make jerky with 2 jerky-style grids, 2 standard grids, and 1 combo cooking grid or rib rack for a total of 5 burners. The 2 externally loaded wood chip trays let you can reduce your heat with no temperature loss for the perfect smoky flavor. The 2 porcelain coated wood chip pans with lids each hold 1-pound of wood chips. You will have a drip pan and water pan. The liquid propane smoker provides dual 11,000 BTUs. The cabinet is made of single walled welded steel and the grates are chrome-plated. You will love the push button ignition for starting up the smoker. The front glass to see through is made of tempered glass. The door is large and is made with aluminum with a handle and Sure-Lock latching system by the manufacturer. It uses a 20-pound propane tank. The dimensions are 60-inches tall x 33-inches wide x 24.5-inches deep. It weighs 93-pounds. You will receive a User’s Manual and a 1-year Limited Warranty on parts with the exception of paint, which is guaranteed to be free of defects for 90 days except for rust that may appear after repeated use. It is made in China. Smoke Hollow® Smoker review video. 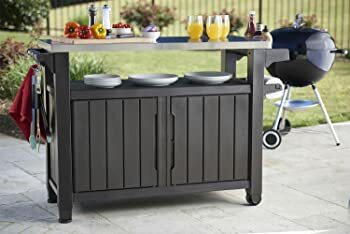 The Keter® extra-large table/prep station/serving cart with metal top is ideal for grilling out. The model number 229369 is a great selling unit for the perfect place to prepare your food and to store items and condiments to serve with your different dishes. It has 78-quarts of storage capacity. 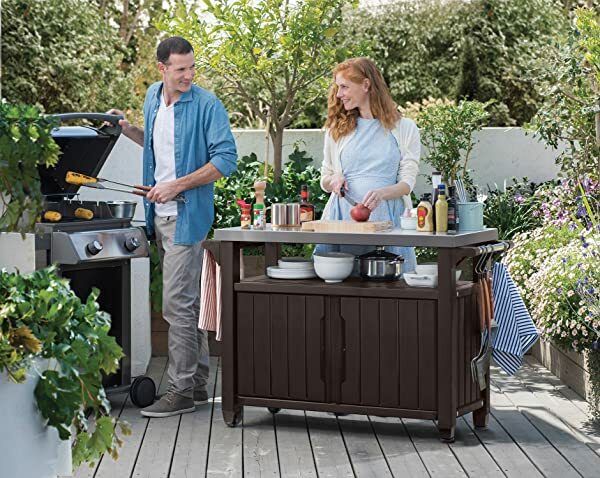 You can store your propane tank, charcoal, towels, dishes and other items in the weatherproof polypropylene resin dark brown plastic unit that looks like real wood. It should be covered if left outdoors in the rain or snow. Keter® does not make a cover, but you could use a large tarp. 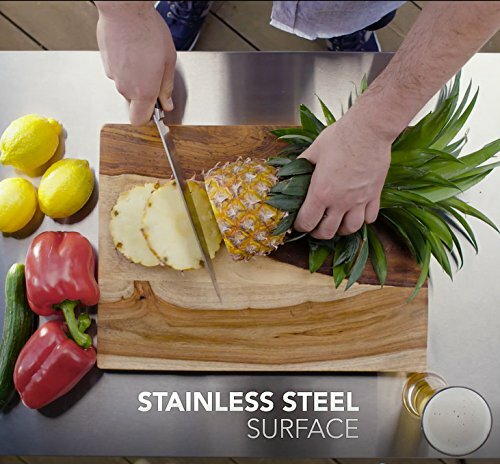 The table top is made of 430 stainless-steel to use with your outdoor kitchen as your prep station and serving table. You can use it inside for storing other items during the winter months. The top is flat without a ledge or flared edges. It has a bottle opener, 2 side bars for paper towels or for holding hooks that are included with 4. You can sit a small grill on top with no problem when it has short legs and is 50-pounds or less in weight. It has wheels to move it about and the legs are adjustable. There are no shelves inside, none can be installed, and the doors open to the front. The table measures 53.1-long x 20.4-inches wide x 35.4-inches tall and weighs 59.15-pounds. You could use this as a kitchen island if you have the floor space or a TV/stereo cabinet in the winter time. Assembly is required. You will receive a User’s Manual and Warranty. It is made in China. Keter® Unity XL BBQ Patio Storage Cart for BBQ grills video. Never put frozen meat on a grill or smoker; let it thaw. Start your charcoal burning using newspaper. Starter fluids will make your food taste strange. Clean your smoker after seasoning by running it empty at a high temp to burn off grease and fat residue. You can wash smokers, but do not use a brush. You can take out the racks and drip pan to wash and clean and after each use is best to keep the grease from becoming thick. The drippings of fat add the quality flavor to your meat. Let it drip for the best taste. For the unsurpassed flavor and tenderness of the meat, temperature control is the critical factor. Beginners will find that an electric smoker is the easiest to control since you can set the temperature and leave the meat to cook without you staring at it. Charcoal or wood smokers are a bit more difficult to control and are used by seasoned cooks. Keep all units 10-feet away from your house or flammable objects. Smoke contains Carbon Monoxide (CO) that kills! So never put a smoker or charcoal unit inside your house, garage, camping tent, or other enclosed spaces. You can die from the fumes that you cannot smell! Season your grates and racks by covering them with cooking oil but not olive oil because it is gummy. Let it run for a few hours to remove the new smell and any other manufacturing byproducts. It’s the same you do to cure your cast iron skillets. After you’ve finished cooking, turn up the heat to burn off the debris and food scraps in the unit and clean the racks each time to not have bacteria grow on them. Read customer comments and reviews on Amazon to see what others have to say about each unit reviewed. 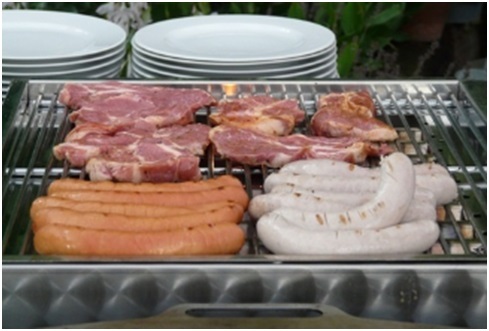 It’s not hard making up your mind once you know the capabilities and features of grills and smokers. Happy shopping!